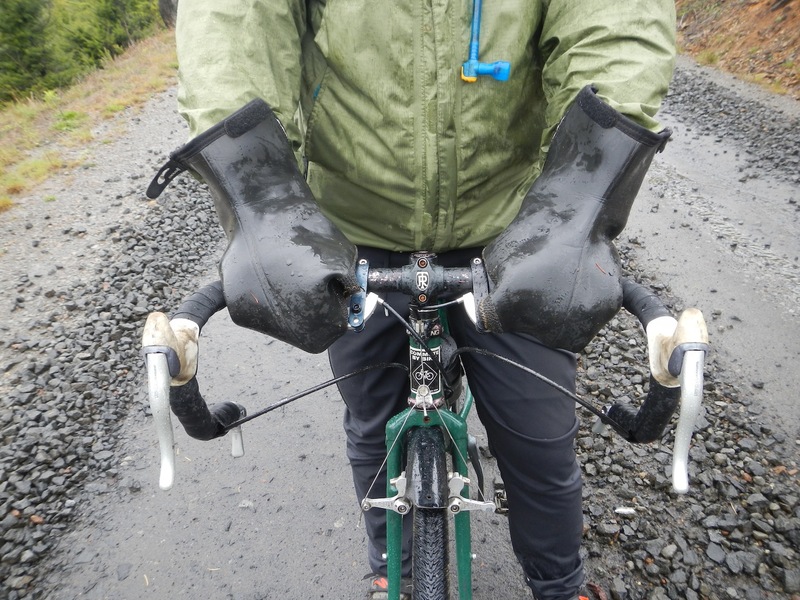 After the giddy Klikitat Mtn road loop, The Logging Road Cyclist set his sights on more exotic terrain. He determined to repeat last September’s Rogue River Trail hike, to see if his feet could still take it, check out the new gear he got to improve his lot, and to enjoy the canyon in the Spring bloom. Wednesday night found him pounding down I-5 after a good-bye dinner with The Long-Suffering Girlfriend. The tasty McMinnimans burger left him sleepy by Eugene, in spite of the “Fresh Air” podcasts he had brought along for distraction, and it took a gooey chocolate chip cookie and a coke to buzz him out enough to make it to Merlin. Finding that flat-broke Josephine County (yes, home of the ophiolite) now charges $19 to sleep at the dump called Almeda Park, he backtracked to Ennis riffle and spent the night. Getting an early start, TLRC made it 17 miles down the trail to Winkle Bar, where Zane Grey once set up shop and gathered materials for his melodramatic “Rogue River Feud”. While getting his supper, TLRC noticed a little tick heading up his leg towards his moister regions. Wiping it off, he zipped up his tent, hoping it wasn’t too late. It was. Lying inside to get out of the rain (a VAST improvement over last year’s poncho/tarp), TLRC found and squashed three more ticks. Howling Fantods. Ticks give TLRC the howling fantods. He shoved all of his gear to one end of the tent, checked the floor and then piece by piece went through every bit of gear. The next day he brushed more off while at Mule Creek, then getting down to the beach at Tate, and every time he left the beach, and then all the rest of the walk through the oak savanna below Clay Hill and the pastures at the end. Part of the stress was TLRC chastising himself for being so hysterical about the ticks, but everyone he has related this story too has has the same reaction: howling fantods. This has helped. After a pleasant week of local training rides, TLRC wanted some bigger game, and since D. was around, they decided to try the long-sought-after Laurel Mtn Massif Traverse, Falls City to the NF Siletz, back through Valsetz. Looked like 45 miles or so. Weather was so-so, 55 degrees rain (showers). After the last failure on Fanno Peak (cf. Anticipate the Obvious), TLRC was loaded for bear: rain pants, a couple of synthetic jackets, new rain jacket, neoprene overboots, food. Even D. brought a big lunch. TLRC changed in the Falls City Cemetery as usual, where he discovered he had only one contact lens. He put it in his dominant eye. D had forgotten his helmet. Off they went into a downpour which turned into a downpour with high wind, then a light snowstorm with high wind. They lowered their sights and decided to backtrack TLRC’s attempted loop around Fanno from a few weeks past. Topping out into the newly bare land comprising the edge of the highlands, the weather got bad. D had no gloves and was rapidly losing feeling in his fingers. Retreat was the obvious choice, but D’s fingers were really suffering on this long descent. With his native generosity and inventiveness piqued by D’s plight, it occurred to TLRC that his neoprene overboots might help out, and they did. D made it back to Falls City without excessive misery, although there was some sniveling about hands that “smelled like feet” (wait until the toe fungus gets him!). Feeling rather smug about being so well prepared, TLRC was looking forward to snuggling back into his dry Carharts. His hubris was repaid by the discovery that sometime between changing and trying to get dressed, he had misplaced them somewhere. Not in car, Cemetery or along any road they could see, TLRC was reduced to rain pants, combat style, for the whole ride home. Worse, just a year ago he lost a pair of ($$$$$) bike shorts to the same Cemetery. Real Twilight Zone stuff.